Two years ago, on the day the ice went out in the lake, my beautiful mother died. Her breath, which had raged in her throat all afternoon, grew lighter and fainter and further away, and then stopped, like the wind after a storm. After her death I did everything that needed to be done, and bore everything that needed to be borne. I kept all her secrets. Yesterday, on the first day of spring, I took my bike out of the garage and rode down to the lake. The ice had gone out, all of it except for a few slabs heaved onto the shore by a storm. From underneath each one came a musical tinkling as hexagonal columns of ice sheared off in the sunlight. I shared a sandwich with a pair of swans, and moiled in the gravel for beach glass. 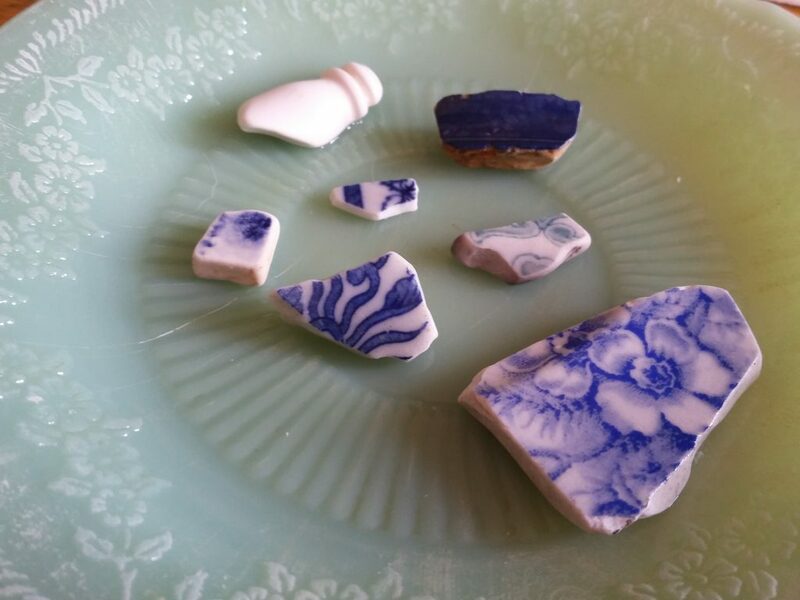 I found part of a tiny porcelain insulator, a Bakelite wheel, four fat nuggets of frosted slag glass, five pieces of blue transferware, and the cobalt rim of a very old crock or pitcher. I brought them home to value and keep, and to learn what may be learned from them. Beach glass, Lake Ontario, 2019. So much wreckage, softened and worn by the erosion of time. Not all of it washes ashore–the lake keeps a few secrets–but enough pieces of it make landfall for parts of the story to be pieced together. Beloved crockery, broken and discarded, returns to haunt or heal. After a storm is the best time to find beach glass. During a storm waves scour the lakebed and churn up the shore, obliterating and then reshaping it. Afterward, the rough outline of points and bays remains the same, but on the beach itself, everything has changed. A beachcomber will, with diligence, uncover the familiar landmarks and, by observing the pattern of the waves and the spill of sediments along the shoreline, identify where artifacts are most likely to wash up. And this is what I did yesterday; what I’ve been doing for two years. I waited out the storm and watched the shore and gathered what could be retrieved.